DemoCurmudgeon: Gun Sanity fights back! Isn’t it about time Democrats counter the Republican agenda with laws that make life incredibly uncomfortable for them. Virginia last week. Attorney General Mark Herring announced that he would unilaterally repeal agreements with 25 other states for reciprocal recognition of carry permits by February 1st, claiming that he found their standards for issuing carry permits too low. 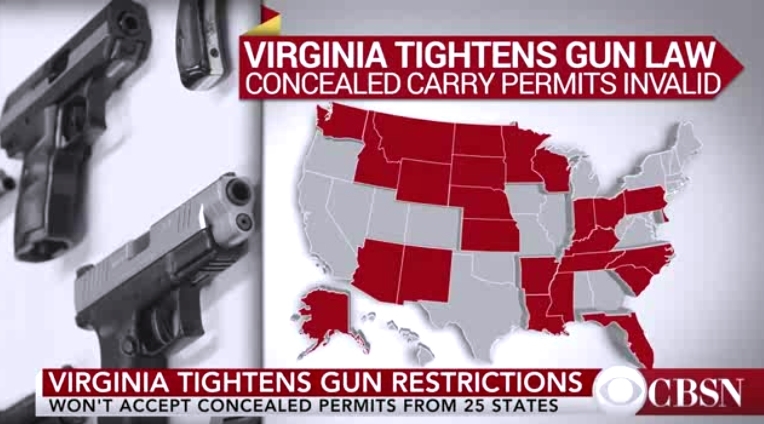 Herring argued that Virginia residents could apply for and receive carry permits in other states when they couldn’t qualify within their own state and therefore evade the restrictions imposed by Virginia law. Yes, yes, yes. And that includes Wisconsin of course, where almost anything goes now. But stopping reciprocity agreements with 25 states will do nothing to deter crime here in Virginia. The question that should be asked of Herring is this: Why target CHP holders if they aren’t committing the majority of crimes? Oh, so CC owners aren't "committing the majority of crimes," just a few of them? Since Gov. Terry McAuliffe, Herring, and Democrats lost big-time in electoral contests last month — despite millions of dollars from their billionaire benefactor Michael Bloomberg — they are now using tyrannical means to impose more gun control as retribution for their losses. What’s the takeaway from all of this? Elections can have very deleterious consequences. Virginians knew very well that McAuliffe, Lt. Gov. Ralph Northam, and Herring were going to enact gun control by any means possible, but they chose to elect them over good men like former Attorney General Ken Cuccinelli and state Sen. Mark Obenshain. Why are they needed in the first place? Article IV, Section 1 of the U.S. Constitution states, “Full Faith and Credit shall be given in each State to the public Acts, Records, and judicial Proceedings of every other State.” The inclusion of that clause clearly intended to prevent these kind of legal traps for law-abiding citizens by forcing other states to recognize the licenses and permits of other states, and its placement in the original articles shows that this takes precedence over the 10th Amendment recognition of state sovereignty. Yes, earlier parts of the Constitution are more constitutional than the latter parts. Love the concept, since that included the 2nd Amendment. The Fox News Debate: The Accountability Project's Nomiki Konst is the best I've seen arguing against irresponsible gun laws. Townhall's Guy Benson on the other hand, doesn't like it when a "Democrat" AG does what he legally can do...by supposed "fiat:"
Guy Benson: "They failed to regain the state senate...Now that they've lost, now that they've had a failed attempt to convince voters, what are they doing, they're having the state's attorney general - a Democrat - impose this agenda by fiat. Now apparently its within his legal right and authority to do so..."
Political Heat: In fact, according to FBI statistics that have studied active-shooter situations (PDF), a person without a gun is more likely to stop a shooter than someone with a gun. Thirteen percent of active-shooter situations studied by the FBI ended with someone using means besides a gun to end the situation. Conversely, in only three percent of all active-shooter situations did a “good guy with a gun” actually stop a “bad guy” with a gun. According to FBI crime stats since concealed carry was implemented in the state, violent crime has gone up in Wisconsin by 22 percent. That’s not to say that concealed carry was responsible for that rise in crime -- but it has failed to make us safer, as proponents like Gov. 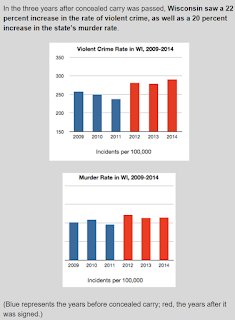 Scott Walker promised it would in 2011.